"Who is Antwuan Dixon?" is a 15 minute documentary wrote, produced, and directed by Zack Warren with no less than Antwuan Dixon. Antwuan is one of the best professional skateboarders in the world and comes form a very hard and interesting life. Antwuan lived with Zack on and off for about 6 months and after seeing so many videos of him fighting for 15 or 30 seconds the pair decided to show the real Antwuan Dixon. They wanted to give a real look at this amazing one of a kind person and give him a chance to tell his story through his eyes. 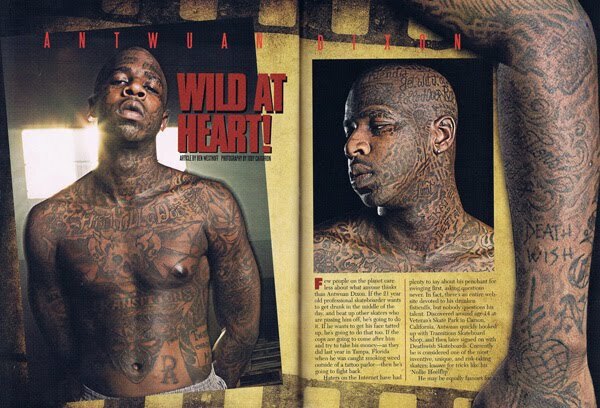 Antwuan Willis "Big Kandy" Dixon wa born August 19, 1988 in in Victorville, California and raised in Carson. He rides for Baker Skateboards' sister company Deathwish Skateboards. Dixon was alternately featured in their promotional video Baker Has a Deathwish. Dixon received his first skateboard from his older brother who had stolen it from a kid, while hanging out at a local recreational park. One of his earliest experiences on a skateboard, include an accident in which he rolled off of a car, subsequently busting his eye open. The incident occurred after he found himself challenged by his brother to do something bold, leaving the top part of the younger Dixon's head permanently scarred. On March 22, 2008, Antwuan Dixon was arrested by Tampa police on charges stemming from possession of marijuana (less than 20 grams) and cocaine with the intent to sell, as well as the battery of 3 law enforcement officers. Dixon was irrevocably held on $4,000 dollars bond, which was subsequently paid for his immediate release.